The Secret Seven novels, second in popularity to Enid Blyton's Famous Five, were first published in 1949 and have remained continuously in print. There are fifteen books in the series and I am reviewing the first seven which, I think, is a most appropriate number. 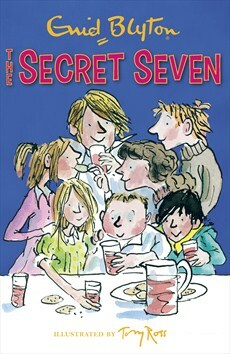 Tony Ross' lively illustrations will appeal to young 21st century readers and in addition to each adventure story there is the bonus of extra stories, a quiz, insights into Blyton's life and details of how fans of the Secret Seven can form their own secret club. I wondered at the start whether modern Australian children would find these stories enjoyable and addictive. Will they be eager to read on? Enid Blyton has been accused of a limited vocabulary in her works and certainly I discovered that she uses a number of words repetitively; there is a great amount of author intrusion; and children will find that the characters are allowed a great deal more freedom than is the norm for today. But with regard to the latter factor, her stories would be very much diminished as the freedom is a necessary and exciting ingredient. The consumption of the sugary food the Seven eat will no doubt appeal, too (though not the penchant for sardine sandwiches!). A few of the club members tend to be somewhat one-dimensional but most are strong characters, particularly Peter, the club's leader, and Blyton has captured wonderfully the way kids interact with each other. The rudeness, bossiness, loyalty, friendship, quarrels and teamwork reflect typical behaviour. On many occasions, the repetitiveness and author intrusion cements each step of the adventure. The importance of Scamper is an endearing touch. The members of the gang, Peter, Janet, Jack, Barbara, Pam, Colin and George plus Scamper, all meet in the garden shed at the home of Peter and his sister Janet. Peter and Janet had come up with the idea of a secret society, with its S.S. button badge each child wears, and the use of a password before admittance to the shed. They have made it comfortable with cushions etc and a lot of the fun is generated by having plenty of food and drink to consume. This information is repeated in various ways in the first two chapters of each novel. Jack's sister Susie who badly wants to belong to the society, adds extra conflict to each story with her interfering ways. Somehow the children manage to track down criminals faster than the local police who are ever-grateful. Book 1. 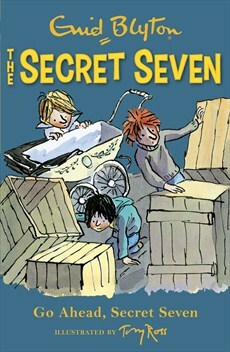 The Secret Seven (ISBN 9781444913439). When the children return from making snowmen in a field opposite an old house, Jack discovers he has lost his badge. As Peter can get very annoyed when rules are broken, he goes back to the field that night to find it. While there, a van with two men pulls up outside the house and then he hears high pitched noises and the sound of the men panting as if in some kind of a struggle. Jack had hidden behind a hedge, and starts to feel afraid, so at the first opportunity, he heads home as fast as he can. Thus begins the Secret Seven's first investigation, and although some may be clever enough to guess what is going on at the house, it nevertheless has been written with plenty of intrigue and suspense which will keep the reader turning the pages. Book 2. 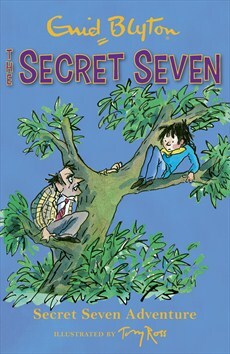 Secret Seven Adventure (ISBN 9781444913446). This adventure has the Secret Seven on the trail of a jewel thief. The background setting is a circus which makes it even more fun to read. Blyton's imagination and story-telling skills are employed to great effect. Book 3. 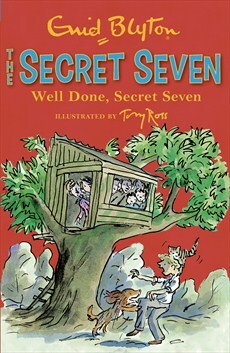 Well Done, Secret Seven (ISBN 9781444913453). A runaway boy with a kitten who seeks refuge in the tree the Secret Seven are temporarily using as a base in the hot weather, instigates another assignment for Peter and Co. I found this storyline implausible. It seemed to me absurd that a small boy would not have been taken back to e.g. Peter and Janet's house for safety reasons, but instead, left to sleep up in a tree. But children will probably view it as an extra thrilling and scary element. Book 4. 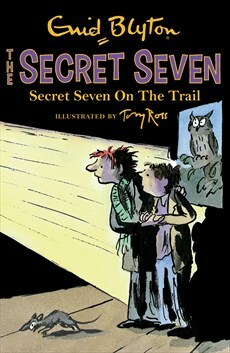 Secret Seven on the Trail (ISBN 9781444913460). This story has a lot of intriguing elements. Jack's annoying sister, Susie, forms her own club and fools the Seven into investigating imaginary crooks at Tigger’s Barn. However, the Secret Seven discover something is going on there and set out to unravel the mystery connected to stolen goods. Some of their antics around the train line are potentially dangerous but Blyton's characters are sensible and come to no harm. Book 5. Go Ahead, Secret Seven (ISBN 9781444913477). The seven decide to practice their sleuthing skills, but unfortunately George who is given the task of shadowing, is pounced on himself. A nasty young man marches him home and complains about George's behaviour. Poor George is immediately banned from the club by his father. I found this parallel dilemma a good ploy, although the way it came about highly improbable. Nevertheless, it leads to the club members discovering a dog stealing racket. Solving it proves perilous but once again all turns out well in the end, especially for George. Book 6. Good Work, Secret Seven (ISBN 9781444913484) Peter and Janet are in the back seat of their dad's car when it is stolen, then abandoned. Bringing the perpetrators to justice is a challenging and dangerous task for the Seven. Blyton ramps up interest by setting it around Guy Fawkes night preparations, complete with fireworks and bonfire. A safety code at the end of the chapter list cautions children and is a thoughtful addition. Book 7. 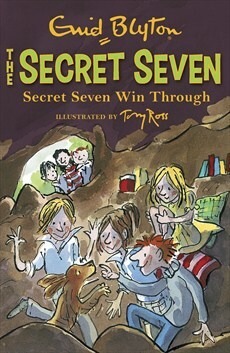 The Secret Seven Win Through (ISBN 9781444913491). While the Secret Seven's shed is being painted, the children use a cave, which Scamper discovered, as their new meeting place. But someone else is using it at night, eating their supplies and messing up their carefully arranged belongings. At first the club members think Susie has somehow found their cave and taken books and cushions away, but they are wrong. Step by step the children discover the real culprits and why they are using their cave which has another entrance. Once again Blyton uses background to hook children and give them enormous reading pleasure. Summing up, I can see why this series is so successful despite dated/English elements and overuse of particular words. Blyton is a magical storyteller. She knows what thrills children and no doubt at the time she was producing her work, her stories brightened the severity of life in post-war England. She also manages to unobtrusively weave in moral issues - respect for elders, work before play, fairness and forgiveness of which many parents would whole-heartedly approve. To date over 500 million copies of Enid Blyton books have been sold, outselling any other children's author. That's a good enough recommendation for me.